Effectiveness of Minimally Invasive Hybrid Surgery for Ileal Interposition (MIHSII) for the Resolution of Type 2 Diabetes. AIM: To evaluate the effectiveness of minimally invasive hybrid surgery for ileal interposition (MIHSII), a novel procedure for type 2 diabetes (T2DM) in patients with a body mass index (BMI) <30 kg/m2. MATERIALS AND METHODS: MIHSII is an innovative technique in which sleeve gastrectomy is performed laparoscopically, followed by extracorporeal ileal interposition performed through a 5-cm midline incision. The procedure was performed on 31 T2DM ( type 2 diabetes) patients, 17 males and 14 females. Their BMI ( body mass index ) values ranged from 21.8 kg/m2 to 29.8 kg/m2, with a mean BMI ( body mass index ) of 26.61 ± 2.61 kg/m2. The average duration of diabetes 8.14 ± 4.89 (range = 1-20) years. Most of the patients exhibited poorly controlled diabetes despite the use of oral hypoglycemic agents (OHAs) and/or insulin. Figure 4. Location of division of proximal small bowel. RESULTS: The mean preoperative glycosylated hemoglobin (HbA1c) for the population was 8.86%. The mean HbA1c 1 year after surgery was 6.80%. The difference between the mean preoperative and 1-year postoperative HbA1c values was significant, at P < .05 (group 1: BMI ( body mass index )= 18.5-24.99 kg/m2, t = 2.83, and P = .022; group 2: BMI ( body mass index ) = 25-29.99 kg/m2, t = 4.23, and P = .001). The resolution rate of diabetes was 80.48%; 48.57% experienced complete resolution, and 31.91% experienced partial resolution. The remaining 19.52% of patients exhibited a significant reduction in HbA1c, although the HbA1c levels did not fall below 6.5%, even with medications. CONCLUSIONS: MIHSII is an innovative technique of metabolic surgery and is a cost-effective and minimal procedure for the resolution of T2DM ( type 2 diabetes) in patients with BMI ( body mass index ) <30 kg/m2. According to the International Diabetes Federation, metabolic surgery is an appropriate treatment for people with T2DM ( type 2 diabetes) and body mass index (BMI) >35 kg/m2 who fail to achieve the recommended treatment targets with medical therapies, especially when other major comorbidities are present. Surgery should be considered as an alternative treatment option in patients with BMI ( body mass index ) between 30 and 35 kg/m2. In Asian patients and in some other ethnicities with increased risk, BMI ( body mass index ) action points may be reduced by 2.5 kg/m2. In nonobese patients with diabetes, the effectiveness of metabolic surgery is not well documented. Laparoscopic sleeve gastrectomy with ileal interposition (LSG+II) is an effective procedure for nonobese T2DM ( type 2 diabetes) patients (BMI <30 kg/m2)3. 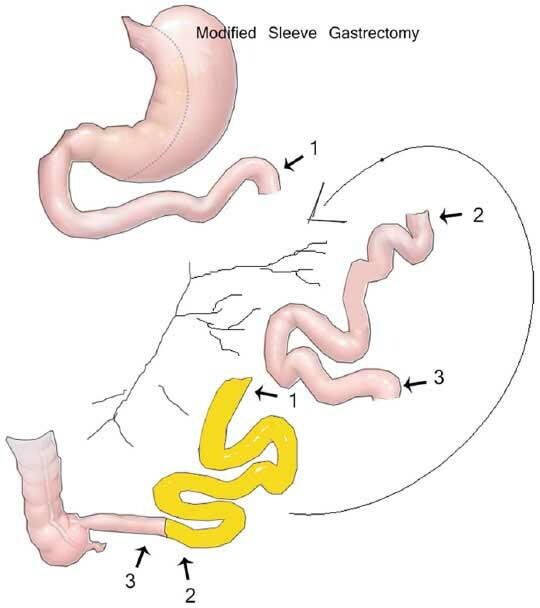 In LSG+II, sleeve gastrectomy is performed laparoscopically with endoscopic staplers, followed by the interposition of 170 cm of the distal small intestinal segment, to a region 30 cm from the duodenojejunal junction. The ileal interposition requires 6 endoscopic staplers for division and anastomosis of the small bowel (9 if stapler entry point closure by intracorporeal suturing is replaced with staplers). In minimally invasive hybrid surgery for ileal interposition (MIHSII), we performed sleeve gastrectomy laparoscopically, followed by extracorporeal ileal interposition through a small umbilical incision. The anastomosis was performed end-to-end with sutures. The benefits of MIHSII include fewer areas of anastomosis and, therefore, a reduction in the number of potential sites for leakage; additionally, MIHSII is cost-effective because the procedure requires fewer staplers. MIHSII is less timeconsuming and is easier to understand and practice. MIHSII can be accomplished without significant impairment of cosmesis. The present study aimed to assess the effectiveness of this novel procedure in resolving T2DM ( type 2 diabetes) in patients with BMI ( body mass index ) <30 kg/m2. This was a nonrandomized retrospective study conducted on 31 type 2 diabetic patients who underwent MIHSII and were available for follow-up at Sunrise Hospital, Kochi, from July 2010 to May 2013. MIHSII is an innovative technique practiced at our center in which sleeve gastrectomy is performed laparoscopically, followed by ileal interposition through a 5-cm midline incision. The study population consisted of 17 male and 14 female patients, all with BMI ( body mass index ) < 30 kg/m2. The mean age of the patients was 45 ± 10.24 (range = 26-65) years. The average weight of the population was 75.44 ± 10.27 (range = 61-102.2) kg. Height varied from 148 to 187 cm, with an average height of 168.12 ± 9.57 cm. BMI ranged from a minimum of 21.8 kg/m2 to a maximum of 29.8 kg/m2, with a mean BMI ( body mass index ) of 26.61 ± 2.61 kg/m2; the mean BMI decreased to 23.39 within 6 months and 21.55 within 1 year of surgery (Table 1; Figure 1). Preoperative parameters, such as BMI ( body mass index ), glycosylated hemoglobin (HbA1c), and diabetic medications, were compared with those noted during periodic postoperative reviews at 1 month and 3, 6, and 12 months to check the resolution rates of diabetes. Per the American Diabetes Association guidelines, complete resolution was defined as persistent HbA1c < 6% in the absence of any diabetic medications for 12 months. Patients exhibiting a reduction of HbA1c to between 6% and 6.5% were considered to exhibit partial resolution. The patients with HbA1c values below the preoperative value but not below 6.5% with medications were considered to exhibit reduced HbA1c with medications. Patients with no significant improvement in HbA1c even on medications that were used preoperatively were considered to have failed the procedure. All patients who underwent MIHSII were included in the study. Diabetic patients at our center who were unable to achieve adequate control of their diabetes were considered candidates for the procedure. Patients with BMI ( body mass index ) > 30 kg/m2 who underwent sleeve gastrectomy alone were excluded from this study as well as patients who did not participate in a 1-year follow-up. All the patients underwent a thorough clinical evaluation by a team of doctors, including a metabolic surgeon, diabetologist, cardiologist, anesthesiologist, pulmonologist, dietician, and diabetes educator. An enquiry regarding the duration of T2DM ( type 2 diabetes) and other obesity-related comorbidities, including hypertension, sleep apnea, fatty liver, dyslipidemia, polycystic ovarian disease, and infertility, was performed. An enquiry concerning the complications of diabetes mellitus, including renal impairment, neuropathy, retinopathy, cardiovascular involvement, and cerebrovascular involvement, was performed. The patient’s medications were also recorded. A physical examination to detect diabetic complications and investigations based on the protocols were conducted. Those who have type 2 diabetes mellitus, with BMI ( body mass index ) < 30 kg / m2, are considered for MIHSII. The medical conditions of the patients were stabilized as best as possible. The patients were counseled regarding diet restrictions after the procedure and probable complications, including gastric or intestinal leak. The patients were admitted 1 day prior to the surgery and were maintained on a liquid diet for 24 hours. Preoperative antibiotics were administered, and informed consent for surgery was obtained (Figure 2). Sleeve gastrectomy was performed using a 5-port technique. The first port (12 mm) was placed at the midline immediately superior to the umbilicus, and the second port (10 mm) was placed toward the left of the first port. Three 3-mm ports were placed at the right hypochondrium, right midclavicular line, and left anterior axillary line. The greater omentum was divided close to the stomach along the greater curvature, preserving the epiploic arcade toward the omentum. A 38F bougie was placed per-orally, and under its guidance, the stomach was divided 5 to 6 cm proximal to the pylorus. Thus, using endostaples, a narrow stomach tube was created, and the entire fundus was resected. Methylene blue dye was instilled to check for gastric leak. The 12-mm incision was extended through the umbilicus to create a 5-cm midline incision, and the small bowel was exteriorized. The ileocecal junction was located, and a position 30 cm proximal to the junction was marked with the help of silk sutures. The duodenojejunal flexure was identified, and a position 30 cm distal to the flexure was also marked with the help of sutures. 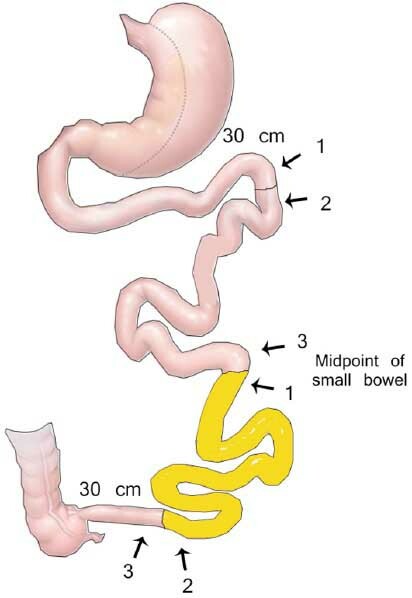 The small bowel was marked midway between these 2 points (Figure 3). Measurement of the small bowel was achieved using a sterile measuring scale. The point of division was identified 30 cm distal to the duodenojejunal flexure. A suture with 1 long thread was placed toward the duodenojejunal flexure. A suture with 2 long threads was placed 5 cm distal to the first suture for the division of the bowel. The ileocolic junction was identified, and the third point of bowel division was located 30 cm proximal to the junction. A 2-tailed suture was placed proximally, and a 3-tailed suture was placed distally 5 cm apart. The 3-tailed suture was placed at the jejunoileal junction (midpoint of small bowel) followed by a single-tailed suture 5 cm apart proximally. The area between the 2 sutures represented the second point of bowel division. 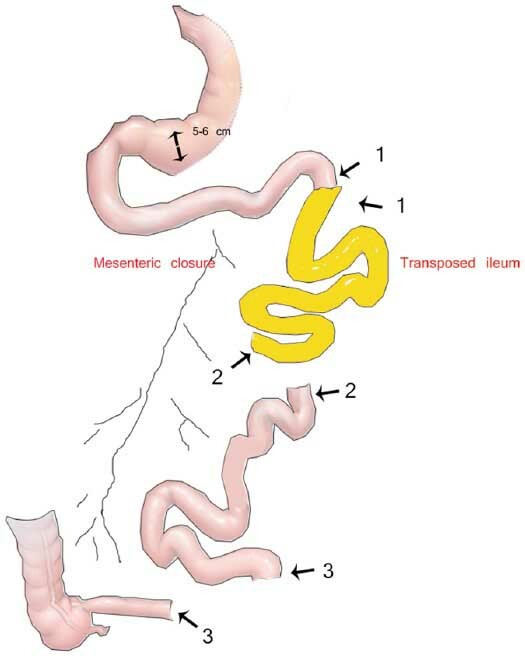 The small bowel was divided at these points in conjunction with the division of the mesenteric arcade, and the proximal small-bowel segment was transposed distally isoperistaltically (Figures 4-6). The suturing aids the restoration of bowel continuity by reconnecting the single-tailed suture to single-tailed as the first anastomosis, the 2-tailed suture to 2-tailed as the second anastomosis, and the 3-tailed suture to the 3-tailed as the third anastomosis. 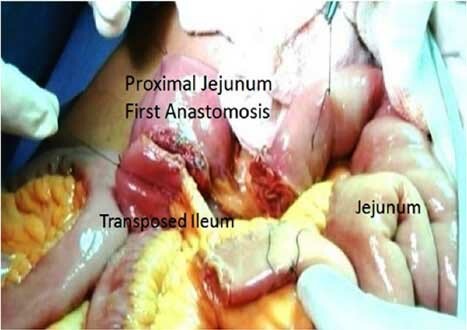 Thus, proximal jejuno-ileal, middle ileo-jejunal, and distal jejuno-ileal anastomoses were performed with extracorporeal 2-layer hand-sewn suture anastomosis using 3-0 polyglactin 910 and 3-0 silk sutures. 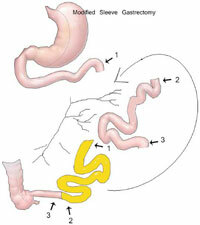 In summary, 1-2, 3-1, 2-3, the 3 sites of division of the small bowel, were converted to 1-1, 2-2, 3-3 of bowel anastamosis. The mesenteric defect was closed to prevent internal herniation, using 3-0 silk sutures (Figure 7). Oral clear fluids were initiated after 48 hours. For the next 2 weeks, the patients were maintained on a clearliquid diet. Vitamin supplements and proton pump inhibitors were also provided to the patients. After 2 weeks, a vegetable- and protein-based diet was initiated, followed by a normal diet in 1 month’s time. Tight control of diabetes was maintained in the postoperative period, with insulin as required. Figure 3. Markings of small bowel. Figure 5. Transposition of bowel matching the identification given by the sutures. In all, 31 patients underwent MIHSII. The individuals were classified into 2 groups based on the guidelines provided by the World Health Organization: group I, BMI ( body mass index ) = 18.5 to 24.9 kg/m2; group II, BMI ( body mass index ) = 25 to 29.9 kg/m2.5 Descriptive statistics were computed on continuous variables such as age, height, weight, and BMI ( body mass index ). Difference in the mean preoperative HbA1c and mean 1-year postoperative HbA1c were computed using the paired t test (P < .05). A scatter plot was used to study the variation in BMI ( body mass index ) over time for the whole population. A bar diagram was used to represent the history of diabetic medications before surgery. All the statistical analyses were performed using Statistical Package for Social Sciences (SPSS) version 19.1 and Microsoft Office Excel 2007. The average duration of diabetes was 8.14 ± 4.89 (range = 1-20) years. The blood parameters indicated good insulin reserves in the patients: fasting C-peptide, 5.08 ± 3.87 ng/mL (mean ± standard deviation); postprandial C-peptide, 7.1 ± 4.20 ng/mL. Out of the 31 patients, 20 (64.51%) were on insulin, 17 (54.8%) were using oral hypoglycemic agents (OHAs), and 9 (29.03%) were on insulin and OHA. Only 3 (9.6%) patients were not on any diabetic medications. The mean preoperative HbA1c for the entire population was 8.86%, whereas the mean HbA1c 1 year postsurgery was 6.8%. The study population was divided into 2 groups: group 1, BMI ( body mass index ) = 18.5 to 24.99 kg/m2; group 2, BMI ( body mass index ) = 25 to 29.99 kg/m2. The difference between the mean preoperative and 1-year postoperative HbA1c values was significant at P < .05 (group 1, t = 2.83, P = .022; group 2, t = 4.23, P = .001; Table 2). Of the 10 patients in group 1, 4 (40%) patients exhibited complete resolution of diabetes and 4 (40%) patients exhibited partial resolution, including 3 (75%) with partial resolution without medications and 1 (25%) with partial resolution with medications. A significant reduction in HbA1c relative to preoperative values was observed in 2 (20%) patients on medications (HbA1c > 6.5%). Of the 21 patients in group 2, complete resolution was observed in 12 (57.14%) patients, and partial resolution was observed in 5 (23.81%) patients, including 3 (60%) with partial resolution without medications and 2 (40%) with partial resolution with medications. A reduction in HbA1c with medication was observed in 4 (19.05%) patients (Table 3). Thus, the procedure was successful, with all the patients exhibiting either complete or partial resolution with medication. Complete resolution of diabetes was high in group 2 patients. Nonsurgical complications, including pulmonary embolism and coronary stent thrombosis, were observed in 2 (6.45%) patients among the study population. The pulmonary embolism was managed with the thrombolytic agent tenecteplase and subcutaneous injection of low-molecular-weight heparin. Cardiac catheterization and thrombus aspiration were used to manage coronary stent thrombosis. Both the patients recovered without any mortality or significant morbidity. No major surgical complications were observed in the study group. Minor complications, including postoperative nausea and vomiting, were observed in 5 (16.12%) patients. No patient exhibited a delay in wound healing or surgical site infection. No mortality was reported in this study group. Bariatric surgery leads to the resolution of T2DM ( type 2 diabetes) within a week, prior to the significant weight loss that occurs over several months. This finding demonstrates that weight-independent factors are involved in the resolution of diabetes. Several hypotheses for the cause of this observation have been put forward, including caloric restriction and hormonal changes. Initially, it was thought that the exclusion of the foregut leads to a reduction in gastric inhibitory polypeptide hormone levels, which leads to a reduction in insulin resistance. This hypothesis formed the basis for procedures such as gastric bypass and biliopancreatic diversion.7 Later studies revealed the increased importance of proximal transposition of the distal ileum to be the more important factor determining the resolution of diabetes. The physiological functions of GLP-1 include increased insulin secretion from the pancreas in a glucose-dependent manner, decreased glucagon secretion from the pancreas by engagement of a specific G-protein-coupled receptor, increased insulin sensitivity in both α cells and β cells, increased β cell mass and insulin gene expression, posttranslational processing and incretion, inhibited acid secretion and gastric emptying in the stomach, decreased food intake secondary to increased satiety in the brain, and promotion of insulin sensitivity. If GLP-1 is administered by injection, it is released to the body even without food in the gut, and the patient experiences satiety even before eating. In the case of surgery-induced GLP-1 stimulation, satiety only occurs after some quantity of food is eaten and is associated with resultant insulin production. The slowing of gastric emptying as a result of the GLP-1 effect can be a problem for patients on injectable GLP-1, whereas combined sleeve gastrectomy resolves this issue in the surgical group. Metabolic surgery is an effective procedure that can achieve complete resolution of diabetes in obese patients. LSG+II is an effective procedure to control T2DM ( type 2 diabetes) in a nonobese (BMI ( body mass index ) <30 kg/m2) population.16 The present study demonstrates the effectiveness of the new MIHSII technique for the resolution of T2DM ( type 2 diabetes) in patients with BMI ( body mass index ) <30 kg/m2. The LSG+II procedure is typically performed entirely laparoscopically. Small-bowel approximation requires 9 endostaples. Hence, the sites for potential leakages are greater than for MIHSII. In MIHSII, the bowel approximation is performed extracorporeally through a small incision, thus avoiding 9 staples and decreasing the potential sites for leakages. Moreover, maneuvering the entire small-intestinal segment is a difficult process when performed laparoscopically, and the entire procedure takes approximately 5 hours. When the procedure is performed extracorporeally, the small-intestinal segment can be easily viewed and measured. The surgery is less time consuming and is easy to understand and practice. Because the incision incorporates the umbilicus, the cosmetic effects are minimal. MIHSII is theoretically the same procedure performed by Dr A. L. De Paula laparoscopically, but we performed MIHSII as minimally invasive surgery without a major incision. This procedure saves significant costs without compromising quality. Performing ileal interposition procedures in patients with BMI ( body mass index ) >30 kg/m2 is generally not necessary because such patients may benefit by sleeve gastrectomy alone. Interposition is required in patients with BMI ( body mass index ) <30 kg/m2 because we cannot completely rely on the correction of the insulin resistance factor. Interposition is performed to increase insulin production by GLP-1. This is achieved without loss of bowel length or absorptive surface. Hence, patients do not experience dumpling syndrome or vitamin deficiency. In this study, 80.48% of patients achieved resolution of diabetes, with HbA1c levels below 6.5%, and 48.57% of these patients experienced complete resolution. Those patients in whom diabetes was not completely resolved achieved good glycemic control after the surgery. The study demonstrated a statistically significant (P < .05) reduction in HbA1c postoperatively. The main limitations of the study were the small sample size and the lack of long-term followup because the procedure is relatively new. The results of this study demonstrate that MIHSII is an easy and safe technique that aids in the complete resolution of T2DM ( type 2 diabetes) in a majority of non-obese patients. MIHSII is an innovative technique for metabolic surgery. It is an effective procedure for the resolution of T2DM in patients with a BMI ( body mass index ) <30 kg/m2. MIHSII is safe and easy to perform. Vaag A, Lund SS. Non-obese patients with type 2 diabetes and prediabetic subjects: distinct phenotypes requiring special diabetes treatment and/or prevention? Appl Physiol Nutr Metab. 2007;32:912-920. Dixon JB, Zimmet P, Alberti KG, Rubino F. Bariatric surgery: an IDF statement for obese type 2 diabetes. Diabet Med. 2011;28:628-642. De Paula AL, Macedo ALV, Mota BR. Laparoscopic ileal interposition associated to a diverted sleeve gastrectomy is an effective operation for the treatment of type 2 diabetes mellitus patients with BMI 21-29. Surg Endosc. 2008;23:1313-1320. American Diabetes Association. Executive summary: standards of medical care in diabetes—2014. Diabetes Care. 2014;37(suppl 1):S6-S13. Global Database on body mass index, an attractive scientific tool for monitoring nutrition transition.